The BC Day long weekend is quickly approaching and that means library closures. However, in addition to the reduced hours for the BC Day long weekend, our Abbotsford Library hours will be reduced for the rest of August. Click here to see the hours calendar. The Chilliwack library will be closed for the entire long weekend (July 30-August 1). The Abbotsford library will be closed Sunday and Monday, but it will be open on Saturday, July 30 (1-5). And during the break between classes (August 21-September 5) the library will be open 8:30-4:30 Monday-Friday only, and closed on Labour Day. We’re looking for “books” for our UFV Chilliwack human library display and event. You can nominate yourself or nominate someone else. Our mission is to present unique experiences that challenge peoples’ understanding of stereotypes and educate people on diversity. 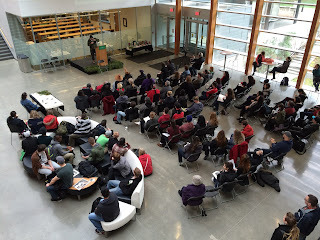 Our criteria is that the people in our human library live or work within UFV’s catchment area and that the topics presented or the people involved have some connection to UFV and its objectives. We’re creating a display for the Chilliwack library, in our large display cabinet, on a poster that will hang in the Chilliwack library and on our website. We’ll also host an event in the winter semester in which members of our human library will be invited to speak and to participate in round-table discussions about their experiences. If this is for you, please fill out this form and return it to the Chilliwack campus library. Saying goodbye to the old Chilliwack library. Starting July 25th, UFV employees will undergo a change in the authentication credentials used for accessing the UFV Library’s databases from off campus. Employees will need to use their Network login credentials (eg. smithj), rather than myUFV credentials (eg. 300012345). Network login credentials are the same as those used to login into employee computers. There is no change to student authentication. If any difficulties arise, please contact the UFV Library or IT Service Desk. 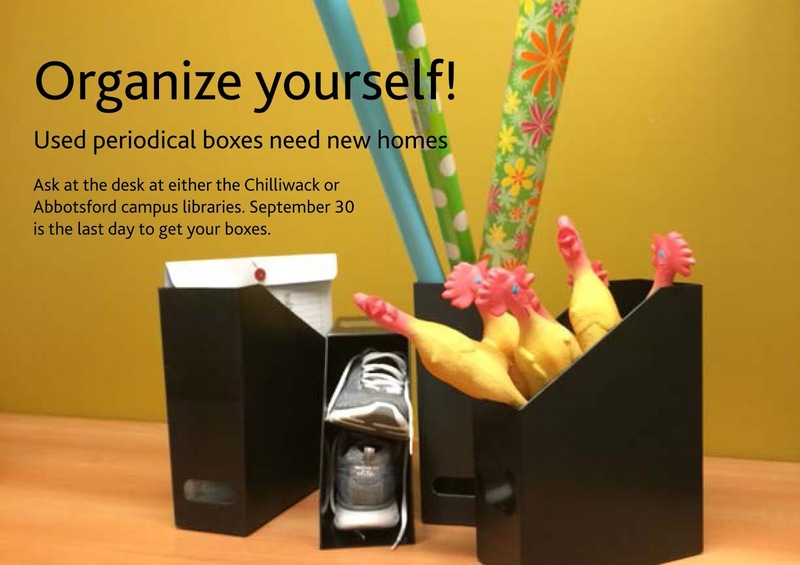 The Chilliwack and Abbotsford libraries have a limited supply of used periodical boxes available for free. Ask at the circulation desk in either library before September 30.